Barcelona pays the best salaries to its athletes. The recent findings in the Global Sports Salary Survey 2018 by Sporting Intelligence have revealed some unbelievable figures about the salaries professional sports teams across the world pay to their athletes. La Liga giants have left the top rung NBA teams far behind in average salaries paid to their athletes. Premier League club Manchester United just make it to the “Top 10 pay masters” chart, dominated by the top basketball clubs. 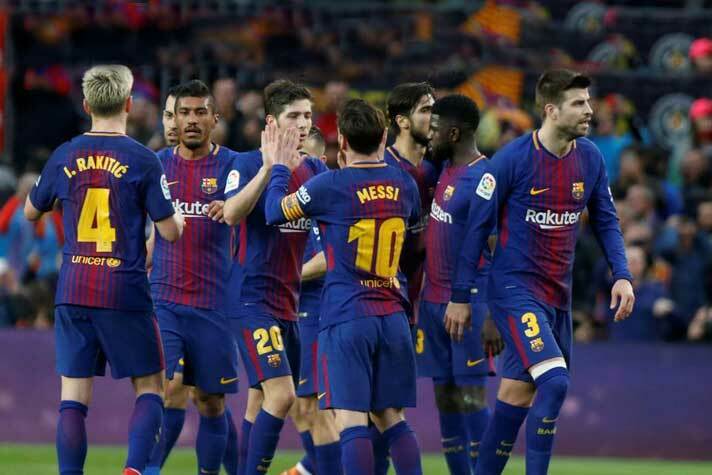 The Spanish soccer giants FC Barcelona are paying annual average salary $13.7 million to its top rung players, 30% higher than fellow Spaniards and arch LaLiga Real Madrid, whose average annual salary is reported at $10.6 million. The top 10 chart has six NBA teams, two LaLiga teams, one Premier league team and one Serie A team. Interestingly enough the six basketball teams separate the top two and the lowest two positions captured by football clubs. The Premier League team Manchester United are paying an average salary of $8.5 million to their first team members. This puts the top flight English Football club at 10th position in Global Sports Salary Survey 2018. The English football club is paying US$8,598,297 as average annual salary, averaging $165,352 per week. The numbers include players’ bonuses and signing-on fees. The Italian Serie A giants Juventus pay $8.8 million average salary to its frontline players per annum, averaging $170,209 weekly. The Miami based professional basketball team Miami Heats are in the overall 8th position in terms of annual average salaries to their athletes – $9,260,911 per annum and $178,094 per week. The Houston-based NBA basketball team are paying an average annual salary $9.8 million to its players. The Southwest Division team, placed7th place inlist, bears and average per salary bill $189,467 per week on account of the top players’ remunerations. The Canadian basketball team are paying an average of $9,970,355 annually and $191,738 weekly to its main team players. The Atlantic division team is settled at 6th position in the list published by Sporting Intelligence. The 14 warriors are acquiring an average annual salary of $10,289,079 and $197,867 weekly from California based NBA team Golden State Warriors. The only team in the major professional North American sports leagues based in the State of Oklahoma are paying an average salary of $10,327,383 annually and $198,604 weekly as per records published by Sporting Intelligence. This makes the Thunders the 3rd-placed team overall and the NBA leaders. The survey report has confirmed that the Whites are paying an average annual salary of $10.6 million to its first team members. This makes the Real Madrid the second highest paying sports team in the world. The Spanish Football club is paying an average salary of $10,644,272 annually and $204,698 weekly. The Spanish Football giants FC Barcelona are paying the record average salary of $13.7 million annually to its first team members. This made the top rung LaLiga team the highest paying sports team ever. The data published by Sporting Intelligence in their annual Global Sports Salary Survey shows the Spanish La Liga champions atop the list with an average salary of $13,398,857 annually and $264,533 weekly.